Home Education Integrity Dental Care’s FREE Back to School Back Packs and Screenings Event! 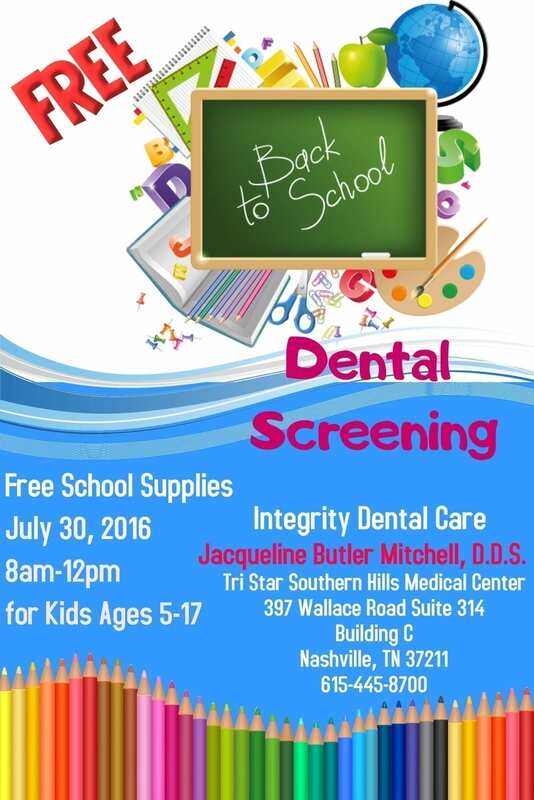 Integrity Dental Care’s FREE Back to School Back Packs and Screenings Event! Dr. Jacqueline Butler Mitchell, D.D.S. It’s that time of year again boys and girls. Back to School 2016 is just around the corner with plenty of events throughout the city that are preparing kids and parents for this special time of year. 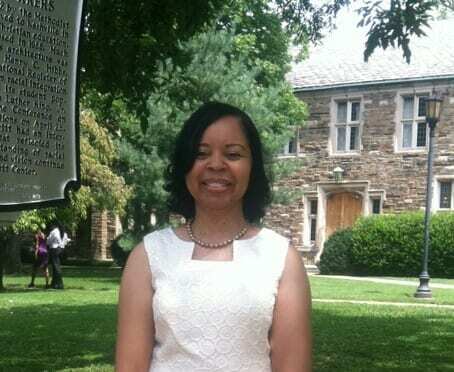 Dr. Jacqueline Butler Mitchell, D.D.S. and her staff at Integrity Dental Care are inviting parents and children to their FREE BACK TO SCHOOL DENTAL SCREENINGS EVENT July 30th from 8am – 12 noon, at the Tri-Star Southern Hills Medical Center 397 Wallace Rd. (Suite 314) Building C Nashville, TN 37211. Children from ages 5 – 17 and their parents are welcome to attend. “We are having a back to school event with free dental screenings, as well as giving away school supplies for children. It will be a lot of fun,” says Dr. Mitchell. These screenings are primarily for us to take a look into the patient’s mouth to see if there’s anything unusual that may catch our eye such as cavities, broken teeth, etc. We will then share with the parent/parents whatever we find, so they will know if the child needs to come back to us or another dentist of their choice, to get the problem resolved.” Hopefully, these dental screenings will also encourage parents about the importance of preventative care and the value of visiting a dentist at least twice a year. After the screenings are done the kids will then receive their back packs full of back to school goodies and a chance to register for the two big drawings. Dr. Mitchell is a general family and cosmetic dentist who has patients ranging from age 2 all the way up to age 100. The current Tri-Star Southern Hills location has consolidated her previous four dental offices into one location. The Dallas, TX native is a proud graduate of Meharry Medical College. Over the years her dental practice has grown from a small staff of three to a current staff of 17 members. “God has tremendously blessed me. It’s been an amazing journey so far” says the doctor. “I am so proud to have a dental office in this area of town because it’s such a diverse community. I have patients from a variety of ethnic groups,” she adds. Dr. Mitchell’s staff is also a reflection of many of her patients, ranging from African American, Hispanic, Anglo and a staff member who hails all the way from the Soviet Union.